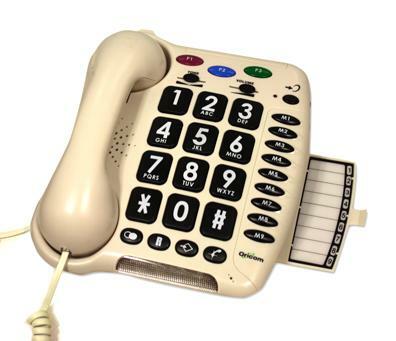 A desktop, corded telephone with large lettering on the keypad. This phone has 3 coloured programmable memory buttons at the top of the phone and 9 additional numbers down the right side. There is a volume slide switch on the front face for the hearing impaired. The red light flashes when the phone rings. A good choice for people who want a simple to operate device or those who accidentally knock off the handset.